Home » Posts Tagged "maximum penalty for DUI"
The “No Refusal Zone” across St. Louis City news was announced in a planned press conference on Monday afternoon. In attendance was, Police Chief Sam Dotson, City Circuit Attorney Jennifer Joyce, and Fire Chief Dennis Jenkerson. The issue has passed through the U.S. Supreme Court and was recently approved. The Missouri law states that: If police pull you over and suspect that you are driving drunk, you can refuse to give a breath test, but the law does not protect you further. You might also not get defense recent nation’s highest court rulings from consequences that follow when you refuse a breath test. You might get your blood drawn without a warranty. Tyler McNeely was arrested in October 2010 by a Cape Girardeau County officer for suspicion of DUI and refused to take a breath test. The refusal led them to the hospital for a no-warranty blood test. It seems like city officials plan this move every time one refuses the breath test. According to eight of the nine Supreme Court justices, this act is a violation of the suspect’s fourth amendment protection law. Therefore, the police must first seek a search warrant before taking any unnecessary search and seizure such as taking blood samples, says Justice Sonya Sotomayor. A Mo. Judge Mike Carter in Wentzville was found not guilty of DWI. In his statement, he applauded the city’s efforts against drunk driving. However, it is quite disturbing to him when a police officer seeks a warrant for a blood test for each and every breath test refusal. Depending on the state, fault in a car accident can be under fault or no-fault based systems. Missouri falls under the fault system, which require that your insurance company covers for medical expenses, economic damage and non-economic damage. Paying a maximum amount per person for bodily injury (“BI”) injuries: $25,000. Paying a total amount for property damage (“PD”): $10,000. The blood alcohol content BAC of an under 21 driver should not read .02% or higher, during a chemical test or else you will be cited for driving under the influence. There is a lookback period or a “washout” period of 5 years- at time when prior DUIs are relevant. If you should operate a vehicle upon the public highways of this state, you should be aware of the implied consent law (this is an essential law being used by all 50 states in drunk driving prosecutions). The implied consent law places you as subject to the provisions of sections 577.019 to 577.041, you give consent to chemical test. If the law enforcement officer has reasonable grounds that you are physically impaired, all the necessary directions will be administered by the arresting officer. A driver can exercise his or her right to withhold consent for the search: the Fourth Amendment. If it is done without warranty, then this gives the offender a shot at suppressing the test arguing that it was not given voluntarily. Since 2014, the state made it easier and faster for the arresting officer to get the warranties required for blood tests- they are obtained almost automatically. 50% of the drivers in City of St. Louis are notorious in refusing to take Breathalyzer tests or cooperate with field-sobriety tests. If you refuse to take the mandatory tests you will go to jail for 10 days or more depending on your case; you will also lose your license for one year. 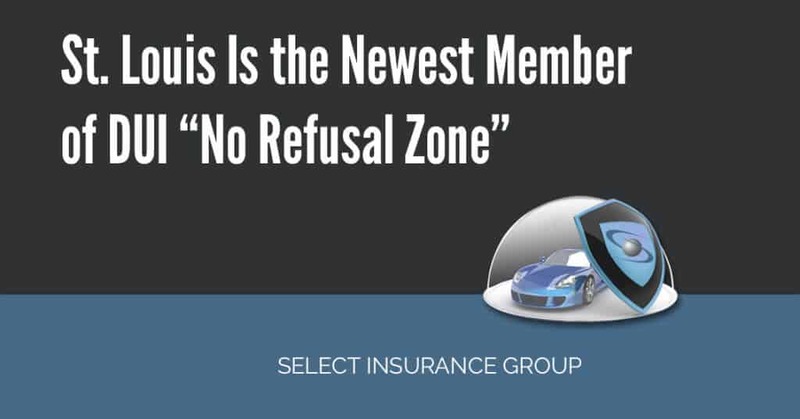 Select Insurance Group is determined to help you know every bit of information that counts if you commit a DUI or DWI in the state of Missouri. For more information about SR22/DUI laws fill our auto quote forms or contact us. We cater for the needs of high-risk drivers in accordance to the state requirements.